PRODUCT DESCRIPTION: NBS 30 Paint and Stain Additive is designed for use in exterior coatings. It will deter and inhibit insects from burrowing through or crawling on exterior coatings and is appropriate for use in residential applications as well as dairy facilities, drive-in restaurants, golf courses, parks, playgrounds, poultry houses, recreational areas, schools, landscape areas, zoos, etc. 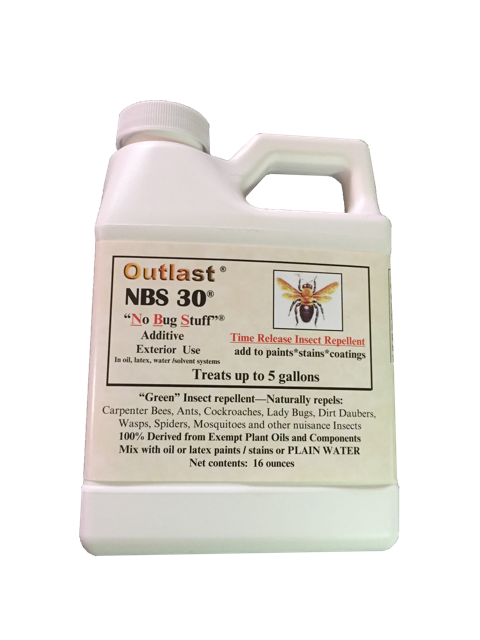 NBS 30 Additive is effective in controlling crawling and nesting activity on painted or stained surfaces to which it has been added. NBS 30 Additive is soluble or dispersible in commercial oil and water based exterior paints and stains. It's also dispersible in plain water for a gentle, botanical approach to nuisance insect control. 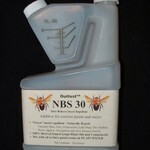 NBS 30 is NOT an insect killer and is not intended for control of termites or other wood ingesting insects. Treatments can last 1-2 years and should be reapplied whenever painting or staining. TARGET PESTS: Ants, Asian Ladybugs, carpenter bees, carpenter ants, cockroaches, beetles, dirt daubers, fleas, ladybugs, lizards, mites, moths, silverfish, spiders, tree frogs, ticks, wasps, woodpeckers and more. WHERE TO USE IT: Exterior paints and stains. RATE OF APPLICATION: 3.2 oz per gallon of paint or stain; the pint is enough for 5 gallons of paint or stain, oil or water base. When used with paint or stain, repellency can last over 1 year. When mixed with water, use 3.2 oz per gallon and spray over 500 sq/ft of exterior surface area. Can be used safely on home siding, plants, etc. When used this way, treatments will only last 30-60 days. Bee proofing. We received the product quickly and believe it will do great but we haven't applied it yet. We did use it on a cedar sided tiny home. It did GREAT! We stopped seeing the carpenter bees and wasps that were invading the house. Will this work well 0n polyurethane or just in stain and paint?? When used as a paint or stain additive, you can get 12 months protection or even longer. But it can also be mixed 3 oz per gallon of water and sprayed on painted surfaces, plants, house siding, polyurethane, etc. like any other "bug" spray. The big difference between the two uses is that when used as a water based spray, it typically will only last 30-40 days. So it will still work, just not nearly as long. Is NBS harmful to birds? Not at all. As listed above, this product uses nothing but essential plant oils for actives. Because these actives are concentrated, many insects and animals will perceive the odor as something "weird" even though they know the smell. But because its so concentrated, they'll feel more comfortable staying away which is why it repels many nuisance pests. But it won't hurt them, people, wildlife or the environment when used as labeled. You should be able to get positive results based on odor alone since they will detect it without having to land on it. So either spraying or "painting" it on the vent covers, air intake cowls, etc. will help as well as applying it around the edges of any decking or motor cover made of canvas. Personally I keep a boat on a local lake and I have found the Phantom aerosol works well for my needs. Its a lot easier to use compared to a liquid and it doesn't stain my deck, railings or any place I've been using it. I apply a light mist around the boat edges to stop mud daubers and spiders. The Phantom works as well as I could expect. I have a 25' deck boat with two large canvas covers so I have a lot to spray but can it all in 1-2 minutes top. And I only do it every 3-4 weeks. I have lots of deck mounted areas the spiders like such as a large anchor up front, several large spot lights and numerous fishing rod holders. These are huge spider magnets but Phantom applied to the surfaces stops all webbing. For mud daubers, I spray all the visible vent openings, cup holders, etc. Treatments seem to last 30 days but my boat has an inboard/outboard so I find spraying under the hatch keeps them out of there too. I only have to treat the engine compartment a couple of times a year and it keeps the area pest free all summer. Now will the NBS work? Probably. But the Viper would be a "stronger" choice and for ease of use? I'd go with the Phantom. We just built a cedar playset for my daughter and as soon as we finished putting it together, Carpenter Bees came from all over. I wanted to know if NBS PAINT ADDITIVE is ok for use on something that children will play on. In fact both our "repellent" sprays are safe enough to be used on play sets without posing any kind of hazard to people. The "organic" option would be the NBS listed above. Mixed at the rate of 3 oz per gallon of water, treatments should repel bees and wasps (it won't kill them, just repel them) and you should see positive results for 3-4 weeks. Now if it turns out this isn't "strong" enough for your needs, try the Cypermethrin. Mixed at 1 oz per gallon of water, you will definitely see longer lasting results compared to the NBS. I'm having the same problem with carpenter bees being attracted to pressure treated wood. The wood I bought already has a brown stain of some kind on it, so it doesn't really need to be stained. Will either or both of these products be effective if mixed with Thompson's Water Seal or a similar product? I plan to apply the sealer to all sides of the wood before construction. When using a sealant on exterior wood, its best to add the NBS to the sealant as NBS is compatible with all forms of Thompsons. This will enable the NBS to "lock in" and provide the best long term protection. Is this plant and flower safe? I am having issues with swarms of bees on flowers budding right by my front door. I've tried citronella and peppermint essential oils with no impact. I don't want to move the flowers because they are beautiful and I'm trying not to kill the bees but I'm getting tired of my kids and I being held hostage in our house. Its plant safe. Mix 3 oz per gallon of water and spray any plant, flower or shrub you want protect. The treatment will effectively repel wasps and bees without killing them. Customers report 2-4 weeks of protection when used this way so it should help. The key is to mix up what you need so if you only have to spray 32 oz of mixed product to get the flowers covered, only mix up that much and use it all. That would require just .75 oz in 32 oz of water. This is important because the mixed solution won't hold up for more than a day or so so don't mix more than what you intend on using at any one time. I want to treat my deck and some window frames with NBS for carpenter bees, this coming Spring 2018. I will also be applying Thompson's Water Seal to these areas. Should I mix the NBS with water and apply first, then cover with the water seal product, or do I apply the NBS just by itself and then after drying apply the water seal? Nothing needs staining or painting. You would be best served by adding the NBS directly to the Thompsons so they both get applied at the same time. This will grant you the longest protection and residual for the NBS applied. Does this add an odor to the paint that people will smell? In other words, will my siding smell bad? Though the concentrate has an odor you can detect if you smell it from the jug while its still contained. Now once you mix it with paint or stain, you won't know its been added so no, its not detectable while in the paint or stain nor after its been applied to your homes siding. Wondering if this product will work around a swimming pool? I live in Arizona & in the warmer months we get paper wasps that land on the pool water. At times there are 4 or 5 siting in the water. Can this be applied on the concrete walkway around the pool & on surrounding plants? We also get annoying flies . Would it get rid of them too? Spraying this around the pool in the yard will help as it uses natural essential oils to "repel" insects. But a more direct approach is to apply some Skillet Algaecide. It will effectively take away the water's surface tension so wasps and bees cannot land on it anymore. If they try, they will sink and after a few find this out, they'll tell the rest of their nests and hives so they will stop coming to visit.